Don’t worry be happy because Tokyo is a perfect gateway for budget travellers! You can enjoy Tokyo with a very minimum budget by enjoying these free but unquestionably exciting activities. Who said you need money to buy happiness? Because all of these free stuff are the ultimate happiness for (poor) travellers like us! Been dreaming of posing with a pretty traditional kimono in Tokyo? Head on to Japan National Tourism Organization (JNTO) office and you can borrow them for free! (Yes, FREE!) You will also get a hand to help you put the kimono on. There is also Japan 2017 calendar for free as a bonus while the stock last. Take a picture or two, and upload it on your Instagram! It’s not every day you get to be Japanese. Located inside a tranquil forest, Meiji Shrine will make you forget you are in a busy city. Don’t be surprised if you come during new year and there’s a crowd. The hatsumode (first prayer in the temple of the year) attracts more than three million visitors to this temple every year! Guessing it’s something like Eid-Ul Fitr Prayers? If you’re not here during the new year, worry not as for the rest of the year, a traditional Shinto wedding ceremony is often held here. It’ll be an exciting experience if you haven’t seen one. This temple is less crowded as compared to Sensoji shrine, it’ll let you experience the calm and sacred atmosphere of the temple. If you are crazy of New York, you definitely should go to the replica of the famous liberty statue in Odaiba. The architect is so thoughtful that it looks so much bigger in photos than it actually is due to the proximity from walkway. With the rainbow bridge as a background, your followers in Instagram might have mistaken it as the real Statue of Liberty! This place is definitely a romantic spot too if you’re on your honeymoon! This palace is where the real majestic Emperor of Japan resides. Located in the heart of the city, Imperial Palace is surrounded by a huge moat (which btw looks more like a river) and green park. You can observe the magnificent palace by jogging around the outer and east garden for free! The inner area of the palace is generally not open to the public. Only on 2 January (New year greeting) and 23 December (Emperor’s birthday) visitors are allowed to enter the inner ground and see the imperial family that will greet from the balcony. The park nearby though, is a very beautiful place to chill and enjoy the greener side of Tokyo while letting your camera snap away! Yoyogi Park is one of the largest city park in Tokyo which suits best for a picnic, jogging, bird watching and other outdoor activities. The park is known for its Ginko tree forest which will turn the land to an epic gold during autumn. They also have athletics stadium, soccer pitch and other facilities that often used for events and concerts on weekend. You can visit this park and Meiji Shrine at the same time as they are in the same area. This was the highest building in Tokyo until it was replaced by Midtown tower in 2007. Tourist will come to the observation deck of this building in the height of 202 meters. From this deck, you can have a clear sight of Kanto region as well as the legendary Mount Fuji. There is also a tourist information centre which provides complete Japan tourism information that you could possibly need. Sometimes they also conduct events, exhibition and showcase the local products. Some of you might be quite familiar with Sumo (wrestling) from Japanese TV show and you might have wanted to see them in live for so long. Try to go to Sumo beya (stable) in town and check their daily morning practice everyday. You can go to one of the big and famous Arashio beya for this. They do not allow visitors to enter the practice arena for safety purpose, but you can watch them through the large windows along the roadside. Opening hours Everyday 7:30 am – 10:00 am . Except for March, July, November, and each one week after the grand tournaments. For those who love bizarre and weird stuff, this place really should be on your Tokyo itinerary. When you heard about the parasite, all you might think of is little tiny evil creatures. But this museum will introduce you to parasite world without the feeling of fear and disgust. The museum has a total of 60,000 parasite specimens collection that will blow your mind. Information is also provided in English so you don’t have to worry this time. Tokyo sight is just too pretty for you to miss. Among the things you should put in your bucket list is to see the beauty of Tokyo from far above so you could get the perfect look of the city. Being on the 46th and 47th floor of a shopping and office complex, Carrot Tower observation desk is a perfect place to see the magnificent scenary above. If you happen to come on December, do not forget to check the romantic christmas illumination displayed on the base of the building. This place is paradise for vintage and antiques hunters. This flea market has a wide selection of antiques ranging from old furnitures, kimono, old coins, used books, paintings, accessories, ewer, and the list goes on and on. Around 25 – 30 antiques booths are participated in this flea market and you can visit Hanazono Shrine after you finish your shopping hunt. This is not just any ordinary tourist information center. 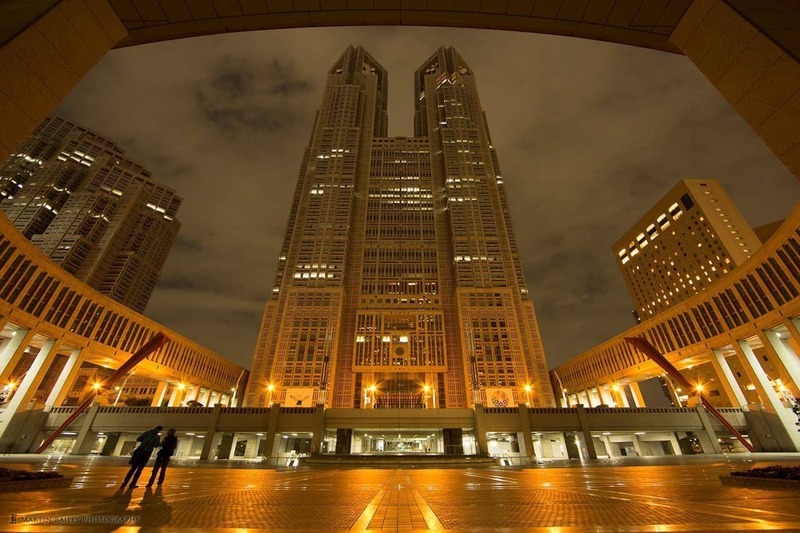 This center building is so famous with its architecture. It looks like smaller buildings stacked into one with sloping ceiling and roof. The two balconies on upper floors complete the sublime design of this building perfectly. And as a tourist information center, you can expect to get everything you need to know about Japan here. Lets have a walk a bit to the west part of Tokyo, don’t be panic if you suddenly feel lost and can’t find any sign of Japan, OMG! Located near to Shinjuku area, Korean town shinokubo will totally make you feel like you are set in a Kdrama. The street foods, markets, restaurant, shops and even the road sign totally portray a South Korean vibe. So why not get a 2 in 1 holiday from your Tokyo trip here? If you are into arts be it the modern or classical, this is one of the place that could satisfy your passion. 3331 Arts is a cultural art gallery located in Chiyoda that hosts a wide range of events and exhibitions. It was a junior high school before converted into an art studio in year 2010. While walking through the floor and enjoying the beauty of arts displayed you can feel the creative energy fueled up your whole body. Are you a Japanese wanna-be? Not that easy. You have to master the Japanese art of paper-folding or so-called Origami before you could become one. But nothing is ever impossible for us, we force you to visit Origami Kaikan and learn the lesson from the maestro here. There is also a demonstration of origami by a sensei which the skill is just fantastic! Are you counting how much money you can save knowing you can enjoy Tokyo by doing all those fun and (most importantly) free activities? LoL. Why not use the money you have saved to enjoy the halal delicacy in Tokyo? Find the most popular halal restaurant in Tokyo with the help of Muslim foodies in Halal Navi. Don’t be left out and download the apps now! Hello, i think that i noticed you visited my weblog so i got here to “return the prefer”.I am attempting to to find issues to improve my site!I guess its adequate to make use of a few of your concepts!! I discovered this site on the search engines. I have acquired an excellent stuff of information. Thanks. Your site is wonderful, and articles are remarkable! very clean and wonderful user genial design. and also with the format to your weblog. I think the admin of this web page is truly working hard for his web page, since here every information is quality based stuff. video clips to give your posts more, “pop”! Your content is excellent but with images and video clips, this website could undeniably be one of the best in its field. I went over this site and I think you’ve got plenty of great information, bookmarked. I’d always wish to be updated on new articles on this web site, saved them to my top picks! Hi. outstanding job. I did not anticipate this.